2019 will be full of new packaging opportunities and new customer relationships as we have now secured the highest High Hygiene BRC grade! We previously (and very proudly) achieved the highest British Retail Consortium certification and this new and improved certificate will open a variety of doors (and boxes) for us! High Hygiene relates to packaging companies producing materials for products that require the highest hygiene standards of manufacturing. It involves direct food contact with packaging and achieving this certificate means we can take on fresh clients and produce fresh designs for their fresh products. Why is High Hygiene so important? Customers can be assured by the set standard of safety, quality and operational criteria set out by BRC. This competitive advantage will further strengthen our position within the food packaging sector and we hope to build more relationships with new customers! 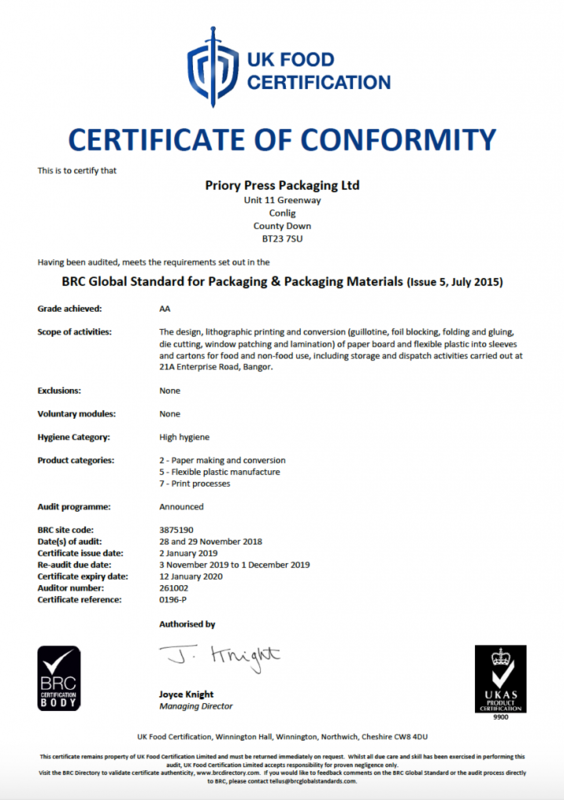 When working with Priory Press Packaging, you can be assured that we aim to be environmentally friendly in all aspects of producing and manufacturing your packaging and we can now do this with more food products. Our packaging ranges from printed food sleeves, gift boxes, shelf-ready, food to go and innovative prototyping. We are excited for our food-to-go range to develop further this year after successfully acquiring our High Hygiene certificate but we also work with the Electronics, Home and Giftware and Health and Beauty sectors. We pride ourselves in having the best practices in place, whether that be internally within our workplace, or externally with our clients. We ensure industry standards are met and we try to go above and beyond to acquire confident packaging and confident customers. Start your story with us! PreviousPrevious post:2019 Packaging Trends: Ethical, Flexible, Luxurious, READYNextNext post:PPP Christmas 2018 Gift Guide!